A couple years ago, I went to review a dance performance that was drawing a lot of attention. The choreographer was a very talented dancer who had formed his own company and was presenting his first evening-length work, and it had a lot of energy behind it. I went, saw the piece, and generally enjoyed it though I didn’t find it particularly deep. It was technically accomplished, but wore its heart on its sleeve and the concept existed mostly to facilitate talented dancers dancing well. My review was generally positive, as were almost all of them, and I sort of put it behind me pretty quick to move on to other things. As it happened, the next weekend I interviewed another choreographer, this one female, and afterward we sat around chatting a bit, at which point she took me to task for my review. Her main complaint was that in all the positive press, no one had mentioned several things she found deeply troubling about the show, and I was forced to admit that really, she had a good point. The intent was clear, so I took it at face value, even dismissed it, and didn’t even really think about it, and wrote about how talented and accomplished the dancing was. I had missed some pretty blunt things by accepting what the artist clearly wanted me to see, and that was wrong, because there was something else there, too. I mentioned that in cases like this, I usually referred to Piss Christ, and she, it turned out, used it as her default example, too. Thus the test was born. 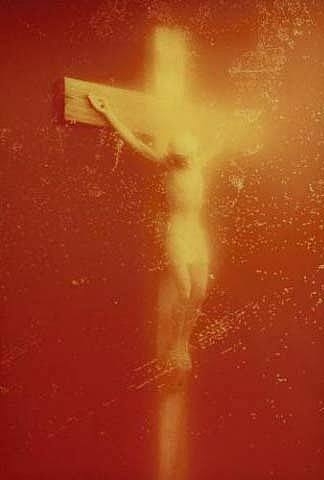 Andres Serrano’s Piss Christ has been at the centre of one controversy or another for a decade. Much of the debate has focused on questions of tolerance and pluralism. The claim that Piss Christ is offensive to Christians seems to suggest, incorrectly I believe, that Piss Christ has neither place nor precedent within the Christian tradition. To the extent that Piss Christ questions the boundaries between the sacred and the profane, it enacts what it represents. It threatens the identity of conservative Christians who respond by seeking to exclude it from the public realm. I consider that what is at stake is not merely the question of tolerance within a pluralist society but also of tolerance within a pluralist Church. To whom do religious symbols belong and who has the authority to prescribe the manner in which they are used? It will be my argument in this article that Piss Christ, regardless of authorial intention, is a profoundly religious work, to the extent that it raises profound theological questions that speaks to the very heart of Christianity. Consequently, after ten years, Piss Christ is still worthy of consideration. Now, here’s the funny thing about it: everything in this is, at least arguably, true from a critical and artistic perspective. In fact I do generally agree with the assessment and the issues raised. The problem is, as an argument, it’s also completely full of it. This is, after all, a photo of Christ submerged in piss. The author is arguing that a clearly and predictably provocative image should not actually be seen as provocative. He argues that a piece that offended a number of people doesn’t qualify as offensive. And by seeing religious imagery solely in cultural product terms, he ridiculously argues that theologians have no place in establishing theology. This is cultural criticism at its risible worst, deployed to defend a work by essentially claiming that people who were offended by it were just wrong. It’s a mind-boggling defense of intent against what people actually saw and thought. And that’s the Piss Christ test: No matter how clear the artist’s intent is to you, part of the analysis of the work is subjecting it to common sense, and wondering what someone who doesn’t spend all their time considering art would see. If the intent doesn’t carry to that person, it fails the test. The reason I bring this up in relation to my piece on Hunka’s comments on criticism is that a lot of my objection had to do with what I took to be a rejection of people who don’t see what the artist wants them to see. I really don’t care when artists say that about critics, but if a critic isn’t “knowledgeable” enough to comment on the art, where does that leave a non-theater person? At the very least, whether intentionally or not, it sounds arrogant and condescending. The fault for a lack of communication, of mutual understanding, is located wholly in terms of the person who doesn’t get it, not the artist who is putatively trying to say something. At some point we have to admit that this is putting the artist’s intent above the actual execution of the piece. The Piss Christ Test is meant to keep the actual communicative aspect of art firmly in view when I’m thinking about whether it’s successful or not. But all too often, when I hear complaints about my reviews from artists, it really is on the grounds that I saw something they didn’t intend, and that this is my fault. None of this is to suggest that all audiences are equal or that all critics ask the right questions or come to right and just conclusions. Nor is it to suggest that artists should refuse to take aesthetic risks for fear someone “won’t get it.” Someone always won’t get it. But applied too broadly and defensively against even engaged viewers, it amounts to an excuse for a failure on the artist’s part. Artists who aren’t concerned about what their audiences take away from a piece have no business complaining about what reviews they get. Artists who do care about communication, then, can’t simply dismiss responses they don’t want to hear, however qualified or knowledgeable the viewer to offer an opinion. The artist doesn’t have to change based on those responses, but they can’t simply be deemed invalid. And this is what underlies my own rejection of the critic as a singular engaged authority: there are no perfect critics, just as there are no perfect audiences, because in the end, the critic is just a member of that audience, too. Work presented to a diverse public has to accept diverse responses. The process of artistic progress is often a matter of the artist sensibly sorting the productive wheat from the chaff. I try not to produce too much chaff, and one of the ways I do so is by using the Piss Christ Test. I would hope that artists use it, too. I find the "Piss Christ Test" troubling in some ways, even though I understand the rationale behind it. The reason is that the Piss Christ episode occurred because it was simply a convenient political football used in a culture war as an excuse to defund the National Endowment for the Arts. It wasn't about art viewers who were offended on one side and defenders of the art on the other side. There was no discussion of art at all. The discussion happened among people who would never set foot in an art gallery, and so the fact that those people were offended was irrelevant. They weren't the audience. It would certainly be silly for you to judge a dance piece by considering what people who wouldn't ever see a dance piece (and, in fact, hate dance) would think of what's happening onstage. I have no argument with your overall thesis here – it's right on; only that the Piss Christ controversy was hardly a proper or relevant basis for a discussion about art criticism. I'm sorry, but while I sort of agree with what you're saying, I stand by what I said. Art gallery goers or no, "Piss Christ" is a photograph that can be seen by anyone. At the time, it was regularly reprinted in magazines. As of tonight, a Google image search for "Piss Christ" returns over 3 million hits. Under such circumstances, it's perfectly reasonable to assume that one does not have to stand in a gallery with the image in order to "see it." Optimal viewing? Perhaps not. But still. Furthermore, the "Piss Christ" Test has nothing to do with the people who see it; it has to do with arts defenders and artists themselves. The reason it makes for a fit example is that reasonably speaking, a devout or even moderately Christian is likely to be put on guard by a title like "Piss Christ." Under those circumstances, my point is, at its most basic, that to argue that the work is only coincidentally and unintentionally provocative (a word I use because within the jargon, "offensive" is apparently something to be debated; a work that gives offense to some viewers can be construed, apparently, as nevertheless inoffensive) is ridiculous when it's called "Piss Christ" and is in fact a photo of Jesus Christ submerged in piss. Any artist who honestly believed that entitling something not just with a scientific descriptor but with a profanity attached to the name "Christ," then created an image of said thing, and just never thought someone might be bothered by it, is either completely full of it, or so completely out of touch that we should wonder whether said person is actually capable of engaging with reality at all. Now, I want to actually speak to Piss Christ, because yes, naming something after it and the controversy that unfolded necessarily invites that response. In the sense that you're arguing it was a manufactured controversy by the political right, I do absolutely agree. The right, much more than the left, loves a good culture war. It never fails to amaze me how much middle America is concerned about how gay marriage in my state (Washington or New York) affects me, by way of example. For all their complaints about what liberals are doing to them, more often than not, it's a bunch of people in the middle of the country imposing their values on us. New York didn't legalize gay marriage in Kansas, they did in New York. I could go on and on venting spleen about this. But that doesn't actually materially change the reality of an image like Piss Christ. Are coastal artists now going to play some game, where their argument is that their art is only for certain people some places? Art put in public is put in public, and in the same way I call out art on this blog that in places I've never been, works that I may never see, the same routes apply to conservative America. In other words, Serrano didn't create that piece without being aware it might be offensive to Christians (that's my supposition, as detailed above, but I think it's true). So in this particular case, I think it's ridiculous to defend the work on the grounds that, essentially, it was not what it was except coincidentally. There are certainly artists who generate unintended provocation, but if we, as a community, are unwilling to defend artists who actively seek to provoke strong responses, what does that do to the idea of free expression? No one in this country has the right not to be offended by the actions of someone somewhere at any time. The failure to stand up for that value vocally during the Piss Christ scandal is a shame. Something similar happened recently after the tussle in DC over the Wojnarowicz film. The argument that, "This is what someone thought at some point in time so they deserve their perspective" is weak and discrediting. Wojnarowicz's image of Christ crawling with ants was more nuanced and complex in some ways that Serrano's. But it was also a provocative image that, like most provocative, is a self-activating work: to take offense at his image is to prove one of his polemical points–that Christian conservatives in this country were and are more concerned with what happens to the body of a plastic statue of a guy who died 2,000 years ago than they are with the living, breathing bodies of Wojnarowicz's friends and lovers who were dying around him. And that's still, apparently, the case. Not to defend, vocally, Wojnarowicz's work as a provocative act on its own terms is not only a disservice to art in general, a retreat from principle, but it's also a dishonor to his memory. The stakes he was talking about were life and death, and the people who shat all over his work should have been put on the spot for the spitting on the dead. I don't think we're in any real disagreement here. I certainly don't claim that art is only for certain people. I merely state (as you agree) that political gamesmanship and opportunism is not art criticism. I spent some time with David Wojnarowicz when he had his incredible exhibit here at Illinois State University (which New York galleries were afraid to show). The local newspaper did a wonderful preview of the work, making clear that many people were likely to be offended, but talking about the background of the work. We had a line down the hallway in Normal, Illinois to see the exhibit, and people talked about it, argued about it, and appreciated it. That was an amazing art experience. When the American Family Association sent flyers out with cropped images of his work to inflame people about the National Endowment, that was not a discussion of art in any way. Republicans: "This is horrible, blasphemous, and has no redeeming value, and the NEA should be eliminated." Democrats: "Piss Christ was an aberration. Nobody thinks that's art. But the NEA has done other things that are good." In my understanding (and I may be wrong), the "Piss Christ defenders" that I heard were merely saying that some people, in fact, DO see it as art and inspirational; not that everyone SHOULD see it that way, nor that is wasn't intentionally provocative. Perhaps you and I have experienced different Piss Christ defenders. Regardless, I think this is an important and valuable discussion and I'm grateful for the postings. Pete–No, I get what you're saying. Fascinating that you got to meet Wojnarowicz, that's pretty cool. All I can say is that I hope people don't get too hung up on specifically the "Piss Christ" aspect of the name; again, the reason I call it that was that during that conversation it turned out that both me and the choreographer used "Piss Christ" as an example of when people talking about a work of art chose to ignore or downplay what we saw as a self-evident component. I also wanted to respond to your initial comparison to dance–"It would certainly be silly for you to judge a dance piece by considering what people who wouldn't ever see a dance piece (and, in fact, hate dance) would think of what's happening onstage." The problem with qualifiers like that (or my "common sense" comment) is that there's no science to this. Someone who actively hates an art form is not a baseline to use in talking about work; trying to appreciate what someone unfamiliar with dance "sees" watching dance is something important to keep in mind. One of that art form's biggest problems is a lack of fluency on the general public's part. But that in turn can't (or at least shouldn't) be used to let dance simply disregard their audiences entirely. "Piss Christ" is not art and the fact it draws 3 million hits on the web doens't make it art any more than the incredible amount Howard Stern is paid makes him an artist.